FIRST of all, as I already mentioned, it´s in the spacing. The arcs can be the same but you increase the contrast of the spacing between each frame. So, for example, if a more realistic motion has a rather even spacing, the cartoony, snappy motion would have some sort of extreme ease out, fast „main action“ and an extreme ease in or overshoot. The pictures below show 4 types of spacing the first one is the more or less standard interpolation version. The second one is the most even version. And the last two bring the spacing to an extreme. Watch the x-translation (red position curve). It´s most obvious there how the exaggeration works. The SECOND thing is preparing the audiences eyes. So because the main action/movement is going to be really fast, you need to prepare the audience for that, so that they know where the limb or whatever will go to. This will prevent your animation from strobing. in each frame is super important as well. This also will lead the eye of the audience! So, in other words, snappiness is part of the well known animation principle of EXAGGERATION. And now imagine how the ball example works for an entire character with a spine for example. Now you can also incorporate the line of action of the whole character following the path of action. This will make the motion even more fluid. See the image of Tom for example in the upper right hand corner. The line of action of his punsh is following the path of action. So, as you may notice, exaggeration works in two directions of course. Make things faster and wider or slower and smaller. 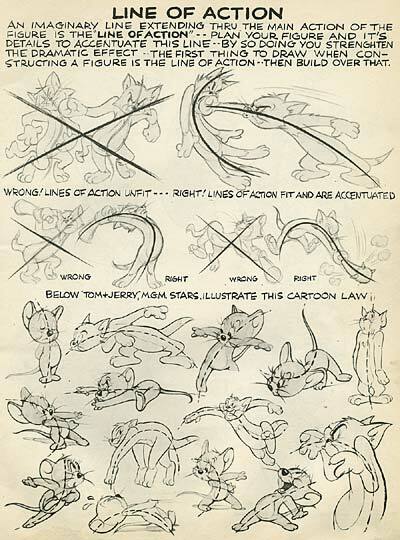 I encourage you to REALLY STUDY, not just look (as always), at some awesome cartoon stuff to see how snappy motion works. It´s HARD to do it right. Good examples might be „Presto“, „Cloudy With A Chance Of Meatballs“, the new Looney Toons 3D shorts and probably old hand drawn stuff, like Bugs Bunny and such.